Nitecore Q4 Battery Charger Brand new Q Series Cute Charger, with output current up to 2000mAh ..
Nitecore Q2 Battery Charger Brand new Q Series Cute Charger, with output current up to 2000mAh ..
Nitecore F2 Battery Charger Introducing the lightweight power bank - the Flexible Power Bank F2..
Nitecore F1 Battery Charger The Nitecore F1 FlexBank can store solar power, collected by solar ..
Nitecore UM20 Battery ChargerCapable of charging Li-ion batteries and an external device, simultaneo..
Nitecore i8 Battery Intellicharger The Nitecore i8 multi-slot intelligent charger monitors and ..
Nitecore SC4 Superb Battery Charger Short for Superb Charging (SC) the Nitecore SC4 is a four-s..
Nitecore D4 Battery ChargerThe Nitecore D4 is a universal smart charger compatible with almost all ..
Nitecore i2 Battery Charger The new i2 aims to provide a safe and seamless user experience. 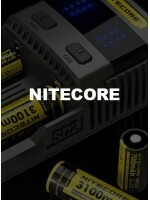 Con..
Nitecore i4 Battery Charger The new i4 aims to provide a safe and seamless user experience. Con..
Nitecore D2 Battery ChargerNitecore D2 Digicharger is a universal smart charger compatible with almo..